The newest edition of Luxury Weddings Magazine is on sale today and we have your preview! Volume eight is brimming with all things decadent and beautiful and is the best source of inspiration for your luxury wedding. Every bride deserves a little luxury on her wedding day - be it a fabulous couture gown, lavish wedding day flowers or dazzling jewels. Luxury Weddings Magazine has all sorts of luxe-inspiration covered! Read on for a sneak-peek of some of our stories, spreads shoots and #swoonworthy fashion editorials! Find your little bit of luxury on page 52 with our 'Wish List' picks of jewellery, beauty, fashion, styling and more. The best in luxury venues and stylists are profiled to help you find the right people to create your dream wedding. If your dream is to shine with the most gorgeous luxury wedding gown, you can start your search on page 72 with our jewellery 'Bridal Fashion 101' story. Once you know all there is to know about gowns, check out our divine 'Château De L'Amour' shoot (starting page 102) which is inspired by a romantic French provincial dream. Deux Belettes in Byron Bay sets the scene for the story and was the perfect backdrop for the elaborate couture gowns. Luxury Weddings Magazine also shot the latest gowns that Australia's couturiers had to offer. We shoot gowns from the best of couturiers such as Crocé & Colosimo Couture, Bizzaro Bridal Couture, Lili Marcs, Velani By Nicky and more and to give brides a fresh and unique perspective. There are also 25 of the most lavish real weddings to inspire you but it's never a dull moment, as each wedding is as unique as it is beautiful! Luxury Weddings Magazine is on sale now! 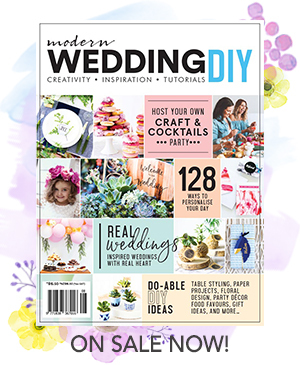 Start your luxury wedding dreaming with your very own copy available at all good newsagents and online.